"Susan Phillips can write this book because she lives it." "This is a book for people who are interested in the how of a life that's really life." "Susan Phillips tells great stories and uses vivid word pictures." "Her contrast between circus and garden reveals deep truths about the overstimulation in our daily lives and Jesus' invitation to cultivate a restful and focused life rooted in him. Cultivation implies habits and discipline, and Susan winsomely invites us into new patterns of living. A garden implies lush green leaves and fruitful bounty, and Susan guides our paths into joy and rest. Come into the garden with Jesus and journey into abundant life." — Lynne M. Baab, author of The Power of Listening and Sabbath Keeping. "The Cultivated Life is filled with gifts of a generous, transparent spirit." 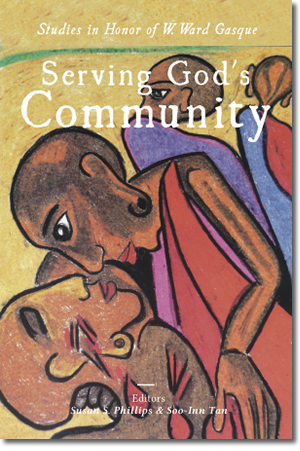 "This book is a timely gift to the community of faith to be treasured and shared." 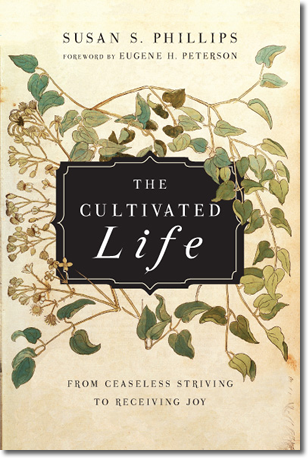 "Susan Phillips's The Cultivated Life is a remarkable work on so many levels." 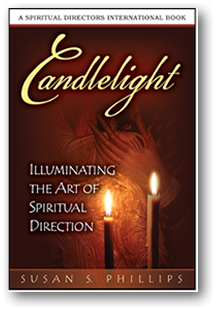 "Susan Phillips provides us with ways to cultivate the contemplative life..."
Candlelight: Illuminating the Art of Spiritual Direction offers an intimate view of spiritual direction through written narratives of actual spiritual direction sessions. The experiential practice is accompanied by theoretical and theological understandings that guide it. The book includes the stories of nine men and women whose stories illustrate how the journey of Christian discipleship is helped by spiritual direction. "Illuminating is the precisely accurate word for this brilliant evocation of spiritual direction in action." "If I were permitted only one book on spiritual direction, this would be it." — Eugene H. Peterson, author of The Message and Professor Emeritus of Spiritual Theology, Regent College, Vancouver, B.C. "Some form of spiritual direction is to be found in all the world religions and in many tribal religions as well,"
"Invaluable for people doing spiritual direction or contemplating it." "More than mere flickers of insight." "Susan Phillips's thoughtful, listening intelligence incandesces in this account of her practice of spiritual direction." "The process comes to vivid life in her personal narratives of sessions with directees in God's presence. I was moved by the way Susan's insights grew in relationship with those she met with over months and years. I felt holiness creeping into my own life." — Luci Shaw, author, Breath for the Bones: Imagination, Art, & Spirit and Writer in Residence, Regent College. Edited with Soo-Inn Tan, 2014, Graceworks/Regent. Trained as a New Testament scholar and blessed with a pastoral heart, Dr Gasque's guiding passion has been the theological education of the laity. He has pursued this passion through strengthening schools, and through encouraging many students who have had the privilege to be taught and guided by him, as well as by his wife and partner in ministry, Laurel Gasque. Dr Gasque's legacy is substantial and varied, but his main legacy will be the many men and women from around the world he helped to fulfill their potential in Christ. "This Festschrift is presented to Dr Gasque on the occasion of his 75th birthday, to honor him for his contribution to the cause of Christ, and with the hope that the things he has been committed to—biblical scholarship, leadership development, and the equipping of the laity—will continue to receive fresh exposure and momentum." edited with Patricia Benner, and containing chapters by the editors and Eugene H. Peterson, Robert N. Bellah, Charles Taylor, Joel B. Green, Anna E. Richert, E. Dawn Swaby-Ellis, David C. Thomasma, Jaime Escalante, Sandi Schaffer, W. Thomas Boyce, Mima Baird, Morris A. Magnan, Theresa Stephany, William Visick, Douglass E. Fitch, Lynn Schimmel, and Harvey Peskin. 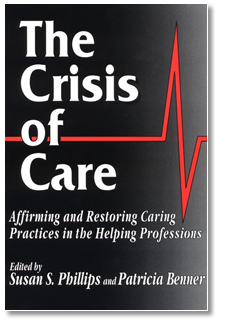 "There is a crisis in caring for persons that cuts across the boundaries of the helping professions." "Health care reform has brought some old thinking to new prominence -"
"Particularly welcome is that the authors of these essays expose..."
"In a world grown both suspicious of and hungry for caring practices,"
"A timely and important book." An evening public lecture given at Regent College, Vancouver, B.C. "The term 'spiritual direction' is bewildering to many. In this public lecture Susan Phillips addresses that confusion, bringing clarification from the practice and theory of spiritual direction, as well as from biblical imagery and metaphor." Edited by Jeffrey P. Greenman and George Kalantzis (IVP Academic, 2010). This book contains Susan Phillips's chapter: "Spiritual Direction As a Navigational Aid in Sanctification." This volume, edited by Jeffrey P. Greenman and George Kalantzis, marks another compilation from the Wheaton Theology Conference. 2009's event produced the wealth of work represented here exploring the theological foundations for a faithful approach to the church practices that contribute to spiritual formation, that is, to our sanctification in the power of the Holy Spirit. Including essays from keynote speakers Dallas Willard and Gordon Fee as well as contributing essays by noted presenters such as Chris Hall, David Gushee, Linda Cannell, Cherith Fee Nordling, Susan S. Phillips and Lawrence Cunningham, this book offers a stimulating exploration of the historical, biblical and theological dimensions of spiritual formation. It will be of special interest to those who serve as pastors, spiritual directors, church ministry leaders and Christian educators. edited by Sharon Gallagher (Wipf and Stock, 2010). This book contains Susan Phillips's chapter "Sabbath Living," as well as chapters by many Christians who have written for Radix magazine and taught at New College Berkeley over the years, including Margaret Alter, Robert Bellah, Susan and David Fetcho, David Gill, Joel Green, Virginia Hearn, Walter Hearn, Margaret Horwitz, Mark Labberton, Earl Palmer, Luci Shaw, and others. A Regent College Evening Public Lecture from Summer 2009. In this public lecture Dr. Phillips considers the spiritual discipline of spiritual direction in terms of its soul-cultivating effects. This lecture was given at Regent College, Vancouver, BC as a part of the 2010 Regent College Evening Public Lecture Series. Susan Phillips urges us to take friendship seriously and practice it as a spiritual discipline. What does it look like to cultivate this classical and biblical practice for a life of discipleship and thriving? In this 2011 Regent College Evening Public Lecture at Regent College, Vancouver, BC, Susan Phillips examines what it means to respond to God's call for us to stop and embrace sabbath-keeping. Sabbathkeeping is a radical practice which, rooted and grounded in the Christian faith, challenges the prevailing attitude of work in today's culture and challenges our own engagement with that culture. Like friendship, listening is remarkably neglected by scholars. Even more surprising, it receives scant attention within the church—we who are called to "listen" to God and God's beloved. In our day of shallow, broad connection—much of it in the forms of texting and posting—there's growing evidence from a variety of fields that the deep, attentional art of listening is health-inducing and life-enhancing, countering some of the pathogenic elements in our environment. Moreover, listening just might be essential to sanctification. In this Regent College Public Lecture Susan Phillips reflects on listening's significance in our lives of citizenship, discipleship, and fellowship. People want to grow - to mature, not only to age. Faith, we're told by the apostle Paul, allows growth in love and insight that, in turn, produce right action and goodness (Philippians 1:9-11). In this Regent College Public Lecture Susan considers growth in faith in light of our culture's dominant disorders of attention and attachment, significant challenges to love that overflows with knowledge and full insight. Extreme manifestations of these conditions are psychiatric, but attention and attachment difficulties permeate the culture. God's grace, too, permeates our world, allowing for the cultivation of ordered attention and attachment. edited by Arthur J. Ammann with Julie Ponsford Holland. Women, HIV and the Church is an accurate, multi - author discussion on the status of AIDs worldwide as the impact of HIV increasingly affects women. The book provides a current update on the subject, and is a compelling invitation to rethink theological and scientific positions in light of the enormity of the problems, progress that is being made and Biblical teaching of Jesus. Susan Phillips's chapter is "A Chrstian Look at Suffering in a Time of HIV." Contact: Questions, comments and inquiries are welcome.